"Of course I'm a melancholy statue. I have spikes in my head, doofus!" That would be a good name for a band, I think. Spikes In My Head, I mean. Although, Melancholy Statue wouldn't be bad either. But those aren't really spikes. They're cones. Obviously someone who had an excess of ice cream cones smooshed them against her head. Isn't it obvious? I think it is. But then, I'm crazy, so what do I know. I do know, however, who that is a statue of. Her name is Hecate. And she was a Greek Goddess. Back when Athens ruled, she was one of the primary Gods people worshipped. And, she was a busy goddess. She was in charge of witchcraft, sorcery, crossroads, herbs, the moon, fire, entrances, poisonous plants, necromancy, magic and light, among other things. She held sway over the Earth, the seas and the sky. And, She has one more very important role. She is the goddess of Otters Oddities. 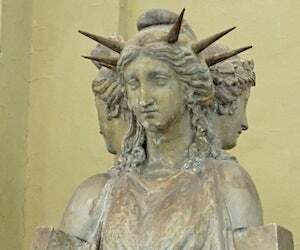 I don't mean that I'm trying to bring back the worship of Hecate. Don't be silly. She isn't my goddess. She's the goddess of my posts. And, technically, she's not even that. It's what she evolved into that is the true goddess of my posts. The ancient Romans, and I do mean the ancient ones, borrowed from Greek mythology and religion to create their own. These ancient Romans I'm talking about are the ones who started the Roman civilization. They had no empire. They were primarily Etruscans who lived in the new city named Rome. The Etruscans knew all about the Greeks. They traded with them, after all. And they also knew that if one was serious about learning, you had to go to Greece. And a lot of them did. These educated Etruscans became the first 'citizens' of Rome. (Just living in Rome didn't make you a citizen.) They also became the rulers. These Greek educated men didn't want to use the Greek religion, though. They were Roman, nit Greek, after all. So, they did what many religions do; they borrowed heavily from existing ones. For example, in Greece, Zeus was the big cheese. For Rome, it was Jupiter. Mars = Ares. Mercury = Hermes. Minerva = Athena. Greek and Roman religion and mythology weren't identical, but they were quite similar. And it's Hecate in her Roman incarnation that I'm talking about. You may be wondering, after reading the things Hecate watched over, what that has to do with my posts. By the time the Romans 'borrowed' her, Hecate was commonly represented in the triplicate, or trimorphic, form pictured above. And this form was generally placed at crossroads. Her three heads watching all directions. The Romans named her after the latin for 'The Three Ways', in reference to her guarding of crossroads. And what is the latin word for 'the three ways'? And that's why she's the goddess of Otters Oddities. Your daily dose of trivia.